Compared to other strategies of investment, Tax Deed can range anywhere from 10 to 90 percent returns, depending on where you buy and when you buy. You can become a landlord when you are investing in tax deeds. By renting a property, you can get 40 percent return from a $100,000 investment. There are lot of people who have jobs, but after learning about tax deed investing they quit and start in the real estate business. In this business, you can own your own time. No need to work full time if it’s not really ideal for you. You can set your own hours and earn. That being said, you do need to learn a new skills, so go easy on yourself in the beginning! In tax deed investing, you own the property once you pay the winning bid and get the deed. There is no redemption period. Simple as that. Now we always suggest you budget money for Tax Title Services or a quiet title action, because you MAY need to get a quitclaim deed in order to sell it…. On the other end of the spectrum, with Tax lien investing, before you can own the property, the owner has time to redeem the property. The owner of the property pays you back of the taxes you paid for the property and all other expenses. You also earn from the interest. Redemption period differs in different states, so be sure to consult our ABC’s guide for more information on those! Unlike buying houses with a bank that has long process, tax deed investing is hassle free. You don’t need to apply for a loan if you have the cash on hand, and no need for you to undergo with attorney fees, credit checks, and all. Just prepare the money, win the bid and pay the taxes. You are good to go with your investment. Yes, it is legal. Local government force the payment of property taxes, so they are ruled by supreme court to seize the property. If property taxes has not been paid by the owner, the government has the right to collect the taxes by selling the property. But What About Security.. Is This Secure? TOTALLY! Tax liens and deeds have been around for over 200 years, and they aren’t going anywhere fast. This is a very secure investment, you just need to make sure you do your due diligence before you buy them! 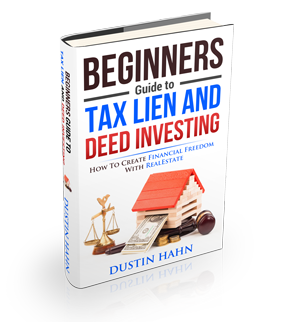 So, if you are looking for a better way to investing your extra cash, or make money in real estate, Tax Lien and Deed investing could be the perfect route for you to take!